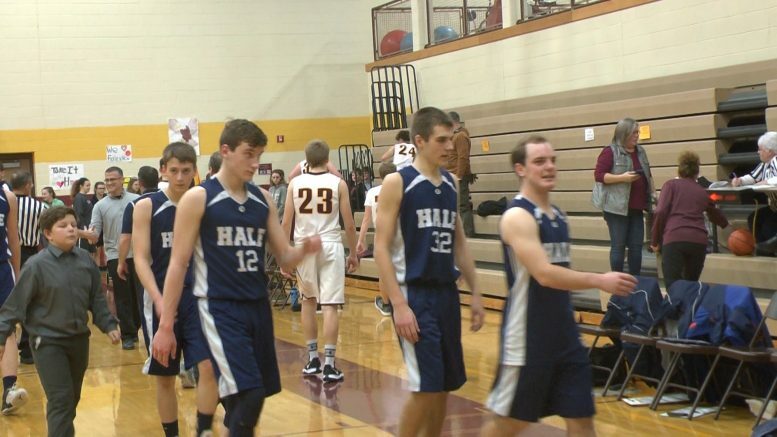 Hale walks off the court following their 56-30 win over Fairview. FAIRVIEW, MI — The Hale and Fairview Eagles faced off in a North Star League-Little Dipper match up Tuesday night. While conference standings were on the line, there was a different focus in the game. Hale junior Joseph Kimmerer entered the night 29 points away from 1000 in his career. He would become the fifth player to accomplish the feat this season; joining Rogers City’s Taylor Fleming, Posen’s Brooke Ciarkowski, Johannesburg-Lewiston’s Tyson Claeys, and Oscoda’s Katelyn Etherton. Kimmerer started out hot, scoring Hale’s first five points and seven in the first quarter, but cooled off in the second with only three points. He would score another twelve in the third and fourth to finish the night with 22. Hale defeated Fairview 56-30 and remains on top of the Little Dipper with a 10-4 overall record (6-3 conference). Kimmerer can reach 1000 during Wednesday’s game in Peck. If weather cancel’s the game, he can earn the achievement at home on Friday against Au Gres-Sims. It’s been a season of milestones across Northeast Michigan. In addition to the four players (so far) who reached 1000 career points in basketball: Andy Dault and Christian Ward (Oscoda) reached 100 career wins in wrestling, Ridge Schutte (Whittemore-Prescott) reached 150 career wins in wrestling, Chris DeRocher broke Alpena’s all time scoring record in basketball, Cooper Black broke Alpena’s single-season shutout record in hockey, and Raegen Eller broke Alcona’s single game score (250) and two game score (471) in girls bowling.